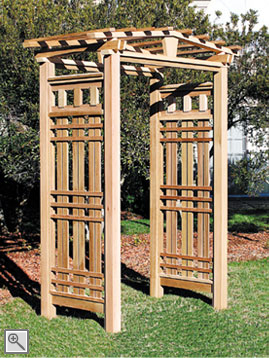 Uncompromised detailing is apparent throughout this beautifully styled arbor. The peaked, portico top and side panels of patterned lattice create a strong American Mission style statement. 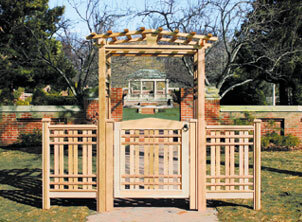 Available with the Monterey Arbor Gate and the Monterey Extensions as shown below, or with any of our other gates and extensions as referenced in the Arbor Gates and Extensions section. The arbor walk-through opening may be customized to any size up to 5'.